Rabbi in Constantinople (1710-20; see Roest, "Cat. Rosenthal. Bibl." i. 265, 524, 579, 986). Printer and editor at Salonica about 1770. He edited and annotated the "Sha'are Raḥamim" of Ḥayyim ha-Kohen and Solomon Abbadi (Nepi-Ghirondi, "Toledot Gedole Yisrael," p. 62; Benjacob, "Oẓar ha-Sefarim," p. 605, No. 1139). Rabbi in Constantinople during the first half of the eighteenth century. Frankl identifies him with the Samuel Ḳimḥi mentioned in the "Shem ha-Gedolim." French grammarian; born in Narbonne 1160; died there 1235; youngest son of Joseph Ḳimḥi, and brother of Moses Ḳimḥi. His father having died while David was yet a child, the latter was brought up by his elder brother Moses. Later he supported himself by teaching Talmud to the young. He was well versed in the whole range of Hebrew literature, and became the most illustrious representative of his name. Later generations applied to him the saying from Abot (iii. 21), "Without ḳemaḥ [= "flour," the etymon of the name "Ḳimḥi"] no Torah"; and he exerted an influence which is felt even to-day. 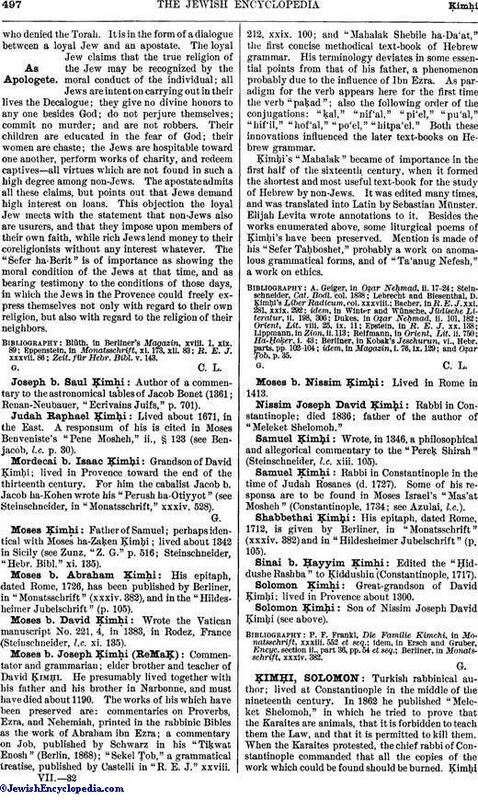 Ḳimḥi's most important work is his "Miklol," in two parts: the first containing a comprehensive exposition of Hebrew grammar; the second, a dictionary of the Bible. The second part, however, having been later considered as a separate work, under the title "Sefer ha-Shorashim," the title "Miklol" has been given exclusively to the grammar. In these works Ḳimḥi, while not original, can not be considered a mere compiler. He digested and assimilated his material most thoroughly; and everywhere there is evident the remodeling and rearranging hand of one who is conversant with the entire range of his science and who surveys the whole with the glance of an adept. Above all he possesses in a high degree the power of systematization and of popular exposition. He excerpted from his predecessors copiously and circumspectly, and arranged his material with such comprehensiveness, clearness, and lucidity of exposition that, while he popularized the opinions of his illustrious forerunners, he at the same time made their works superfluous and helped to sink them into an oblivion from which they were not rescued until the nineteenth century. Ḳimḥi was, however, conscious of his position as an epigone, as is evident from his short preface to the "Miklol." His grammatical material is drawn chiefly from the works of Ḥayyuj and Ibn Janaḥ and from the writings of his own father. He tries to understand the language from itself, seeking analogies in later Hebrew, less frequently in Aramaic and Arabic. Joseph Caspi and Profiat Duran frequently attack him, but Elisha b. Abraham defends him in his work "Magen Dawid" (Constantinople, 1517). The "Institutiones" and the "Thesaurus" of Sanctus Pagninus are essentially nothing else but elaborations of Ḳimḥi's "Miklol"; and Reuchlin and Sebastian Münster have also made considerable use of his work. The latest important work on Hebrew grammar, by E. König, is written "with constant reference to Ḳimḥi." Also connected with grammar is Ḳimḥi's work "'Eṭ Sofer," containing rules for the writing of Bible-rolls, Masoretic notes, and accents. His "Book of Roots," the second part of the "Miklol," shows Ḳimḥi to be even more independent. Although based primarily on the dictionary of Ibn Janaḥ, he is quite self-reliant in the treatment of his subject. Besides Ibn Janaḥ he quotes as authorities Jacob b. Eleazar and his own father. He refers frequently in his dictionary to Masorah and grammar. He increased lexicological material through numerous fresh etymologies as well as through new comparisons with modern Hebrew and Aramaic. Many words he translates into his Provençal vernacular, and at times compares this latter with Hebrew. Ḳimḥi wrote commentaries on Genesis, the Prophets, the Psalms, and Chronicles. Some scholars ascribe to him also commentaries on the remaining books of the Bible. He wrote, too, a philosophic explanation of the cosmogony and of Ezekiel's vision. In the introduction to his commentary on the Prophets he explains the duty of expounding the Bible from a religious standpoint. In a general way he adheres to the literal meaning of Scripture; and his exegesis is based on grammar and rationality. At times, however, he introduces into his explanations philosophy; and some Biblical narratives he, following Maimonides, explains as visions. His commentary on the Psalms is especially noted for its polemics against Christianity. The numerous quotations from the Targumim scattered throughout his writings furnish valuable material for a futurecritical edition of these works. In the Middle Ages Ḳimḥi's commentaries were held in high repute among Christians as well as Jews, and numerous Latin translations were made of them: the influence of his commentaries on the English Bible is evident on every page (comp. Abrahams, "Jewish Life in the Middle Ages," ch. xix.). Besides his commentaries he wrote "Bi'ur Shemot ha-Nebu'ah" and "Bi'ur Sheloshah 'Asar 'Iḳḳarim." Ḳimḥi's polemics against Christianity, contained in his commentary on the Psalms, were, after they had been omitted by the censor in later prints, published separately under the title "Teshubot la-Noẓerim." His "'Wikkuaḥ,"against Christianity, is contained in "Milḥemet Ḥobah" (Constantinople, 1790). In the quarrel between the Maimonists and the anti-Maimonists, Ḳimḥi took a very active part, defending Maimonides. At an advanced age he traveled as a delegate from the cities of Lunel and Narbonne to Spain to induce the Jewish communities there to side with the Maimonists. Having fallen sick in Avila he could not complete his journey, and entered into correspondence with Judah al-Fakhkhar, but with little success. Teshubot la-Noẓerim, at the end Ḳimḥi's commentary to Psalms, Iany, 1542, at the end of Lippmann's Niẓẓaḥon, Altorf, 1644, and frequently. Lived in France about 1350; for him Moses b. David Ḳimḥi (see below) wrote, in 1383, Vatican Manuscript No. 221, 4 (Steinschneider, "Hebr. Bibl." xi. 135). Lived in Constantinople prior to 1738. Lived at Frascati, Italy, in 1326 (Berliner's "Magazin," i. 45). Died in Rome in 1717; his epitaph was published by Berliner in "Monatsschrift" (xxxiv. 382) and in "Hildesheimer Jubelschrift" (p. 105). Father of Sinai Ḳimḥi; rabbi in Constantinople about 1700. Lived in Castiglione, Italy, about 1378 (see Buber, "Sifre de-Agudta," p. 1b, Wilna, 1880; Berliner, in "Monatsschrift," xxxiv. 382). Rabbi in Constantinople, where, in 1736, he wrote an approbation for the "Reshit Ḥokmah" (Roest, l.c. p. 337). Lived in Arles in 1394 (Gross, "Gallia Judaica," p. 89). Lived in Arles about 1393 (see Gross in "Monatsschrift," xxix. 174). Casuist and liturgist at Nyons (France) during the fourteenth century; known also as Mestre Petit de Nyons. He was the author of a responsum, of "azharot" found in the Avignon and in the Carpentras maḥzors, and of a commentary upon the azharot of Solomon ibn Gabirol. A number of responsa of Solomon b. Adret are addressed to Isaac. He is said to have written other Talmudic works, and is in general highly spoken of by his contemporaries (see Zunz, "Z. G." p. 466; Landshuth, "'Ammude ha-'Abodah," p. 124; Renan-Neubauer, "Les Rabbins Français," p. 680; Gross, "Gallia Judaica," p. 385). Rabbi in Hebron about 1783. Author of '"Abodat Yisrael" (Smyrna, 1736), of an explanation of the 'Abodah of the Day of Atonement, and of a responsum found in "Mayim Rabbim (see Azulai, "Shem ha-Gedolim," ii. 50; Benjacob, "Oẓar ha-Sefarim," p. 427). Hebraist and pedler; born at Constantinople 1720; died in London about 1800; a son of Samuel Ḳimḥi, and a descendant of the ancient and noted family of Ḳimḥi. He was a wellknown character in the city of London, where, as an itinerant vender of Oriental slippers, he frequented the vicinity of the Royal Exchange. Ḳimḥi was the author of "Shoshannat Ya'aḳob," a commentary on the tractates Beẓah and Ta'anit (Constantinople, 1748). His portrait was painted by Oseas Humphreys (1799), who was attracted by Ḳim-ḥi's picturesque appearance. Cat. Anglo-Jewish Hist. Exh. p. 54. Grammarian, exegete, poet, and translator; born in southern Spain about 1105; died about 1170. Forced to leave his native country owing to the religious persecutions of the Almohades, he settled in Narbonne, Provence, where he probably spent the rest of his life. The report that he was buried in Mayence deserves no credit. He lived in poor circumstances, and in addition to his literary labors he was active as a teacher. Of his many students the names of only a few have come down. Besides his own son Moses there are mentioned R. Joseph ibn Zabarah, R. Menahem b. Simon of Posquières, and R. Solomon b. Isaac ha-Nesiah. His son David, though but a child at the time of his father's death, may also be considered one of Ḳimḥi's pupils, either directly through his works, or indirectly through the instruction he (David) received from his elder brother Moses. Abraham ibn Ezra, who in his wanderings visitedNarbonne in 1160, must have met Joseph. The latter followed Ibn Ezra in some particulars, e.g., in the use of the stem for the paradigm of the verb. Ibn Ezra, on the other hand, quotes Ḳimḥi in his commentaries on the Bible. Both scholars worked at the same time and along the same lines to popularize Judæo-Arabic science among the Jews of Christian Europe by excerpting from and translating Arabic works. Although Ibn Ezra was Ḳimḥi's superior in knowledge, the latter can rightly claim to have been the first successful transplanter of Judæo-Arabic science in the soil of Christian Europe. His diction is elegant and lucid, the disposition of his material scientific, his treatment of his subject even and without digressions; so that his works are much better adapted for study than those of Ibn Ezra, which lack all these qualifications. Another famous contemporary of Ḳimḥi was R. Jacob b. Meïr, surnamed "R. Tam," of Ramerupt, who was the greatest Talmudic authority of the day. This scholar, wishing to settle the literary quarrel between the followers of Menahem b. Saruḳ and of Dunash b. Labraṭ, had written a book of "hakra'ot" (decisions), in which he took the part of Menahem. These decisions did not satisfy Ḳimḥi; and, feeling himself better able than R. Tam to pass judgment in the case, he wrote (1165) his "Sefer ha-Galui." This work falls into two parts: the first treats of the differences between Menahem and Dunash; the second contains independent criticisms on the former's dictionary. In the introduction Ḳimḥi apologizes for daring to come forward against so eminent a man as the leading Talmudic authority of his time. Hearing that the ignorant among the people will attack him on that account, he puts into their mouths the words which Abner, the captain of Saul, spoke, when David cried out to the king: "Who art thou that criest to the king?" (I Sam. xxvi. 14). His fears were realized; for Benjamin of Canterbury, a pupil of R. Tam, made observations on the "Sefer ha-Galui," defending his teacher. He also called Ḳimḥi in a contemptuous sense "Ha-Ḳore" (= "The Crier"), because the latter ventured to cry his contradictions to the "king," i.e., R. Tam. In Ḳimḥi's grammatical works "Sefer Zikkaron" (edited by Bacher, Berlin, 1888) and "Sefer ha-Galui" (edited by Matthews, ib. 1887) he is dependent on Ḥayyuj for the treatment of his subject, but in his explanations of words he relies mainly on Ibn Janah. On the whole, he is not original; in minor points, however, he goes his own way, becoming therein the model for future generations. Thus he was the first to recognize that the hif'il has also a reflexive and an intransitive meaning; he was also the first to arrange a list of nominal forms, to indicate eight verb classes, and to classify the vowels into a system of five short and five long ones. In his works he pays frequent attention also to the language of the liturgy. In his etymological explanations he seeks for analogies in Bible, Talmud, Targum, and in Arabic. In cases where such analogies are wanting or unsatisfactory he is guided by the principle, "The unknown must be deduced from the known." Not seldom he explains difficult words on the basis of phonetic laws laid down by himself. Of his exegetical works few have been preserved. Mention is made of his "Sefer ha-Torah," a commentary on the Pentateuch; his "Sefer ha-Miḳnah," a commentary on the Prophets; and his "Ḥibbur ha-Leḳeṭ," of unknown contents. A commentary by him on Canticles exists in manuscript; his commentary on Proverbs has been published by Bär Dubrowo under the title "Sefer Ḥuḳḳah" (Breslau, 1868); and variants to the badly printed text are given by Eppenstein in "Zeit. für Hebr. Bibl." v. 143 et seq. 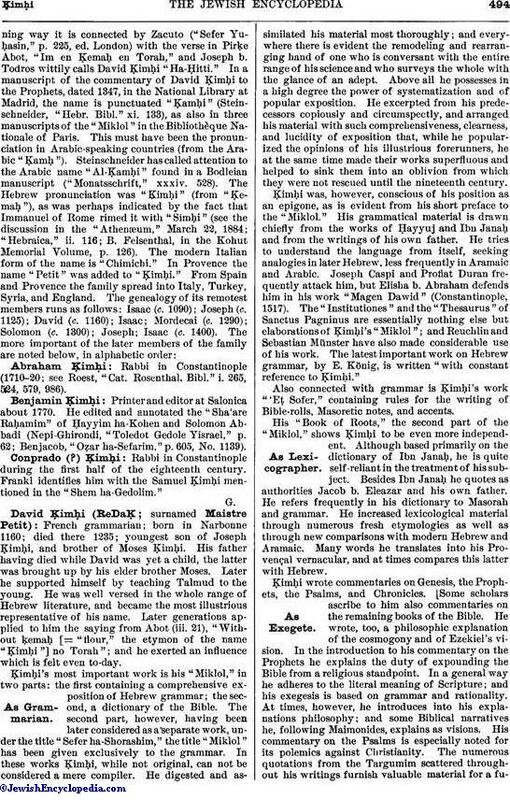 A fragment of his commentary on the Book of Job has been published by Schwarz in his "Tiḳwat Enosh" (Berlin, 1868); the remaining portions, by Eppenstein in "R. E. J." xxxvii. 86 et seq. Many exegetical remarks are scattered throughout Ḳim-ḥi's grammatical works. His method is mostly that of the peshaṭ, i.e., literal interpretation. He frequently follows the Spanish school, without, however, reading into the Scriptural text the scientific knowledge of his own time. He pays a great deal of attention to the context, a point usually neglected by haggadists. His explanations are short and terse. While criticizing at times some untenable explanations of his predecessors, he accepts such as seem to him to be correct. He is the first eclectic of the Provençal school of exegetes. Ḳimḥi tried his hand also at writing poetry. His liturgical hymns and other poems which have come down are indeed distinguished by beauty of form and elegance of language. In spirit, however, they can not be compared with the works of the great Spanish poets. Nevertheless he retains importance as one of the Provençal poets. His poems met with consideration at the hands of later generations and were frequently quoted by them. He translated Baḥya ibn Paḳuda's ethical work "Hobot ha-Lebabot" from Arabic into Hebrew; and he turned Ibn Gabirol's "Mibḥar ha-Peninim" into metrical form under the title "Sheḳel ha-Kodesh." 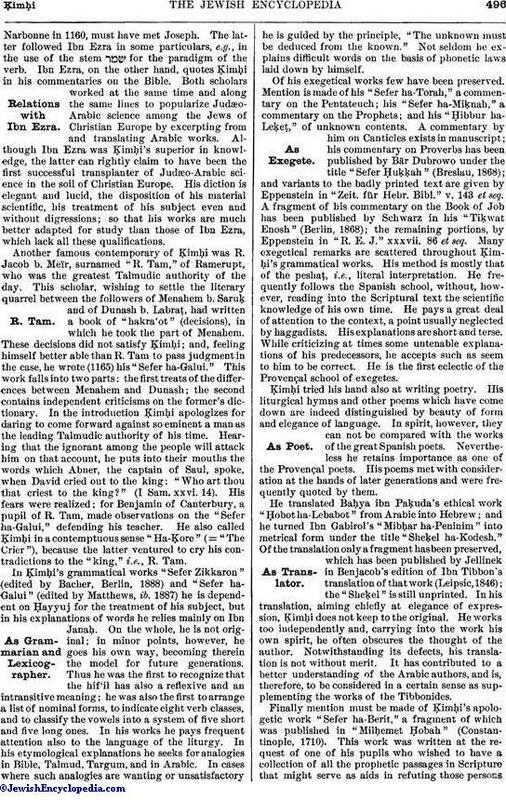 Of the translation only a fragment has been preserved, which has been published by Jellinek in Benjacob's edition of Ibn Tibbon's translation of that work (Leipsic, 1846); the "Sheḳel" is still unprinted. In his translation, aiming chiefly at elegance of expression, Ḳimḥi does not keep to the original. He works too independently and, carrying into the work his own spirit, he often obscures the thought of the author. Notwithstanding its defects, his translation is not without merit. It has contributed to a better understanding of the Arabic authors, and is, therefore, to be considered in a certain sense as supplementing the works of the Tibbonides. Finally mention must be made of Ḳimḥi's apologetic work "Sefer ha-Berit," a fragment of which was published in "Milḥemet Ḥobah" (Constantinople, 1710). This work was written at the request of one of his pupils who wished to have a collection of all the prophetic passages in Scripture that might serve as aids in refuting those personswho denied the Torah. It is in the form of a dialogue between a loyal Jew and an apostate. The loyal Jew claims that the true religion of the Jew may be recognized by the moral conduct of the individual; all Jews are intent on carrying out in their lives the Decalogue; they give no divine honors to any one besides God; do not perjure themselves; commit no murder; and are not robbers. Their children are educated in the fear of God; their women are chaste; the Jews are hospitable toward one another, perform works of charity, and redeem captives—all virtues which are not found in such a high degree among non-Jews. The apostate admits all these claims, but points out that Jews demand high interest on loans. This objection the loyal Jew meets with the statement that non-Jews also are usurers, and that they impose upon members of their own faith, while rich Jews lend money to their coreligionists without any interest whatever. The "Sefer ha-Berit" is of importance as showing the moral condition of the Jews at that time, and as bearing testimony to the conditions of those days, in which the Jews in the Provence could freely express themselves not only with regard to their own religion, but also with regard to the religion of their neighbors. Zeit. für Hebr. Bibl. v. 143. Author of a commentary to the astronomical tables of Jacob Bonet (1361; Renan-Neubauer, "Ecrivains Juifs," p. 701). Lived about 1671, in the East. A responsum of his is cited in Moses Benveniste's "Pene Mosheh," ii., § 123 (see Benjacob, l.c. p. 30). Grandson of David Ḳimḥi; lived in Provence toward the end of the thirteenth century. For him the cabalist Jacob b. Jacob ha-Kohen wrote his "Perush ha-Otiyyot" (see Steinschneider, in "Monatsschrift," xxxiv. 528). Father of Samuel; perhaps identical with Moses ha-Zaḳen Ḳimḥi; lived about 1342 in Sicily (see Zunz, "Z. G." P. 516; Steinschneider, "Hebr. Bibl." xi. 135). His epitaph, dated Rome, 1726, has been published by Berliner, in "Monatsschrift" (xxxiv. 382), and in the "Hildesheiner Jubelschrift" (p. 105). Wrote the Vatican manuscript No. 221, 4, in 1383, in Rodez, France (Steinschneider, l.c. xi. 135). Commentator and grammarian; elder brother and teacher of David Ḳimḥi. He presumably lived together with his father and his brother in Narbonne, and must have died about 1190. The works of his which have been preserved are: commentaries on Proverbs, Ezra, and Nehemiah, printed in the rabbinic Bibles as the work of Abraham ibn Ezra; a commentary on Job, published by Schwarz in his "Tiḳwat Enosh" (Berlin, 1868); "Sekel Ṭob," a grammatical treatise, published by Castelli in "R. E. J." xxviii. 212, xxix. 100; and "Mahalak Shebile ha-Da'at," the first concise methodical text-book of Hebrew grammar. His terminology deviates in some essential points from that of his father, a phenomenon probably due to the influence of Ibn Ezra. As paradigm for the verb appears here for the first time the verb "paḳad"; also the following order of the conjugations: "ḳal," "nif'al," "pi'el," "pu'al," "hif'il," "hof'al," "po'el," "hitpa'el." Both these innovations influenced the later text-books on Hebrew grammar. 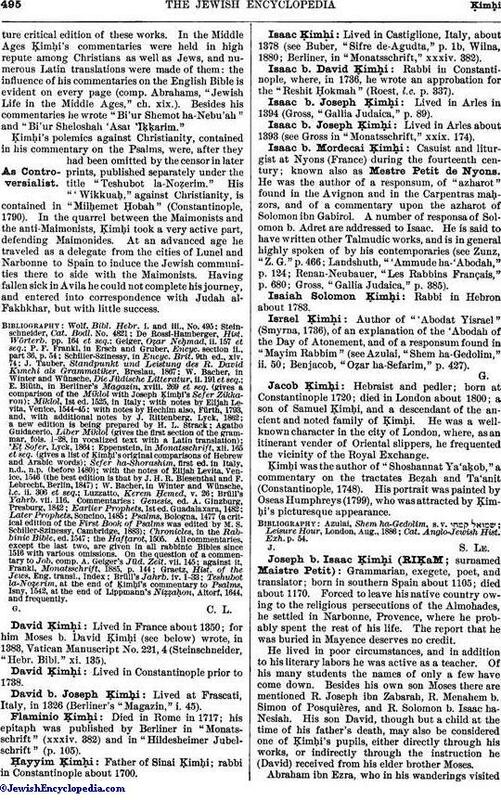 Ḳimḥi's "Mahalak" became of importance in the first half of the sixteenth, century, when it formed the shortest and most useful text-book for the study of Hebrew by non-Jews. It was edited many times, and was translated into Latin by Sebastian Münster. Elijah Levita wrote annotations to it. Besides the works enumerated above, some liturgical poems of Ḳimḥi's have been preserved. Mention is made of his "Sefer Taḥboshet," probably a work on anomalous grammatical forms, and of "Ta'anug Nefesh, a work on ethics. and Oẓar Ṭob, p. 35. Lived in Rome in 1413. Rabbi in Constantinople; died 1836; father of the author of "Meleket Shelomoh." Wrote, in 1346, a philosophical and allegorical commentary to the "Pereḳ. Shirah" (Steinschneider, l.c. xiii. 105). Rabbi in Constantinople in the time of Judah Rosanes (d. 1727). Some of his responsa are to be found in Moses Israel's "Mas'at Mosheh" (Constantinople, 1734; see Azulai, l.c.). His epitaph, dated Rome, 1712, is given by Berliner, in "Monatsschrift" (xxxiv. 382) and in "Hildesheimer Jubelschrift" (p. 105). Edited the "Ḥiddushe Rashba" to Ḳiddushin (Constantinople, 1717). Great-grandson of David Ḳimḥi; lived in Provence about 1300. 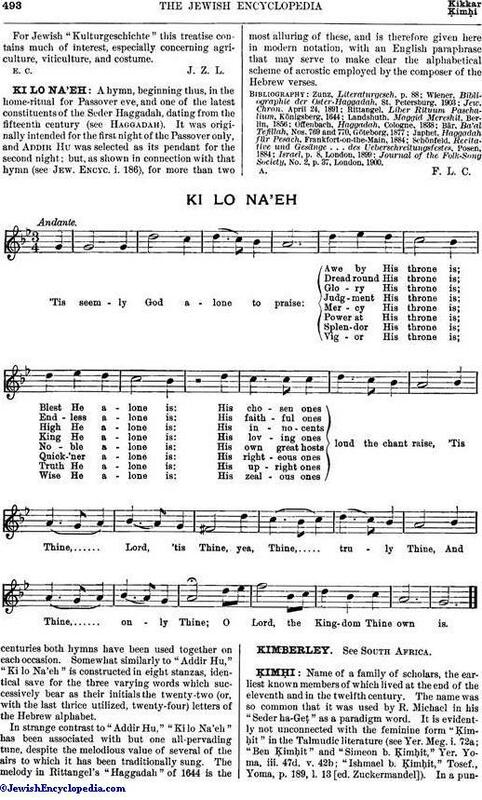 Son of Nissim Joseph David Ḳimḥi (see above). Berliner, in Monatsschrift, xxxiv. 382.